If your body is a temple, then why not keep your temple as clean and pristine as new fallen snow? I love to relax by taking a long, hot shower, but in order to do so and not have my skin dry out, I always use the richest moisturizers I can find. When Lush offered to send me some of their best selling Honey I Washed the Kids soap, there was no way I could pass it down. For those unfamiliar with Lush, it's a British beauty company that's famous for their handmade, natural soaps, bath and beauty products. 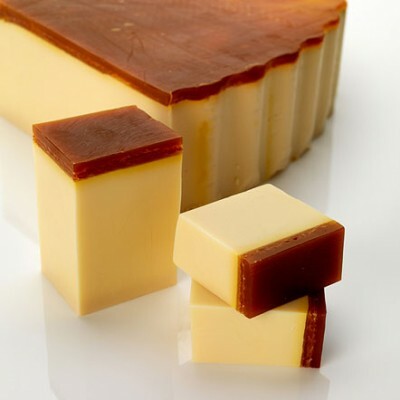 My first memory of Lush was their soaps that looked like fudge and this delectable smelling soap follows in those footsteps with its resemblance to dulce de leche. Known for its deliciously sweet scent of honey, toffee and refreshing orange, this soap is designed to protect and envelop your body in moisture. This soap also contains in smaller amounts: sweet wild orange oil, bergamot, aloe vera, gardenia and lemon. For a 100g bar, you'll pay $7.95. It's a little smaller and definitely pricier than your average soap, but is your regular shelf soap handmade and organic? I think not. The best thing about this soap is the fragrance. Handmade soaps always have the most amazing fragrance and this one does not disappoint. When you first inhale, the smell of caramel and honey hits your senses and washes away all else. Then, you get hit with this refreshing citrus undertone of orange and lemon. This soap is the perfect combination of a dessert-like scent that you'd use to relax at night and tangy citrus smells that wake you up in the morning. I almost didn't want to use it as a soap, but rather as an air freshener, it smelled that good! This soap doesn't foam as much as conventional soaps, but it cleans and rinses easily and leaves a slight scent. Although many reviews noted a tightening of the skin post-shower, I didn't notice this myself; rather I found this soap to leave my skin nicely soft and smooth. The one thing I don't like about this soap is the hard "caramel" part on the top. At first I was charmed by its resemblance to one of my favourite desserts, but soon I found this topping to be nearly impossible to use in the shower. After a couple weeks of use, my soap is slowly becoming tapered towards the soap end, while the topping remains untouched. I'm not sure why the soap is this way and I've tried just using the topping against my skin, to no effect. Overall though, I quite liked this product and I think I'll be putting more Lush soaps on my wishlist in the future!